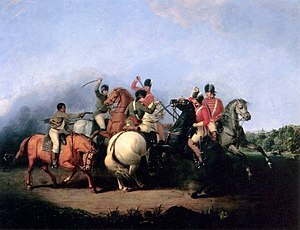 The Battle of Cowpens was an engagement during the American Revolutionary War fought on January 17, 1781, between American Colonial forces under Brigadier General Daniel Morgan and British forces under Lieutenant Colonel Sir Banastre Tarleton, as part of the campaign in the Carolinas ( North and South). The battle was a turning point in the American reconquest of South Carolina from the British. Morgan's forces conducted a double envelopment of Tarleton's forces, the only double envelopment of the war. Tarleton's force of 1000 British troops were set against 2000 troops under Morgan. Morgan's forces suffered casualties of only 20 killed and 69 wounded. Tarleton's force was almost completely eliminated with almost 30% casualties and 55% of his force captured or missing, with Tarleton himself and only about 200 British troops escaping. A small force of the Continental Army under the command of Morgan had marched to the west of the Catawba River, in order to forage for supplies and raise the morale of local Colonial sympathizers. The British had received incorrect reports that Morgan's army was planning to attack the important strategic fort of Ninety Six, held by American Loyalists to the British Crown and located in the west of the Carolinas. The British considered Morgan's army a threat to their left flank. General Charles Cornwallis dispatched cavalry ( dragoons) commander Tarleton to defeat Morgan's command. Upon learning Morgan's army was not at Ninety Six, Tarleton, bolstered by British reinforcements, set off in hot pursuit of the American detachment. Morgan resolved to make a stand near the Broad River. He selected a position on two low hills in open woodland, with the expectation that the aggressive Tarleton would make a headlong assault without pausing to devise a more intricate plan. He deployed his army in three main lines. Tarleton's army, after exhaustive marching, reached the field malnourished and heavily fatigued. Tarleton attacked immediately; however, the American defence-in-depth absorbed the impact of the British attack. The British lines lost their cohesion as they hurried after the retreating Americans. When Morgan's army went on the offensive, it wholly overwhelmed Tarleton's force. Tarleton's brigade was wiped out as an effective fighting force, and, coupled with the British defeat at King's Mountain in the northwest corner of South Carolina, this action compelled Cornwallis to pursue the main southern American army into North Carolina, leading to the Battle of Guilford Court House, and Cornwallis's eventual defeat at the Siege of Yorktown in Virginia in October 1781. In the opinion of John Marshall, "Seldom has a battle, in which greater numbers were not engaged, been so important in its consequences as that of Cowpens." Babits' figures can be summarized as: 82 Continental light dragoons; 55 state dragoons; 45 militia dragoons; 300 Continental infantry; about 150 state infantry, and 1,255–1,280 militia infantry, for a total of 1,887–1,912 officers and men. Broken down by state, there were about 855 South Carolinians; 442 Virginians; 290–315 North Carolinians; 180 Marylanders; 60 Georgians and 60 Delawareans. Morgan's forces were strengthened by these core elements of relatively seasoned troops and his own brilliance in leadership. His Continentals were veterans (Marylanders from the 1776 Battle of Brooklyn), and many of his militia, which included some Overmountain Men, had fought at the Battle of Musgrove Mill and the Battle of Kings Mountain. The experienced British forces (and particularly their relatively young commander) were accustomed, especially in the Southern Theater, to easily routing often 'green' militia, and could have underestimated the opposition. The Continentals in the center, as ordered, mounted a bayonet charge. Tarleton's force, faced with a terrible surprise, began to collapse; some men surrendering on the spot, while others turned and ran. Howard's men charged forward and seized the two British grasshopper cannons. William Washington's cavalry came around from behind the opposite American left to hit the British on their right flank and rear. Pickens' militia, having now reorganized, charged out from behind the hill, completing a 360-degree circle around the American position to hit the 71st Highlander Scots on the British left flank and rear. Howard ordered the Virginia militia, whose withdrawal had brought on the British ill-fated charge, to turn about and attack the Scots from the other direction. The shock of the sudden charge, coupled with the reappearance of the American militiamen on the left flank where Tarleton's exhausted men expected to see their own cavalry, proved too much for the British. Nearly half of the British and Loyalist infantrymen fell to the ground whether they were wounded or not. Their will to fight was gone. Historian Lawrence Babits diagnoses "combat shock" as the cause for this abrupt British collapse—the effects of exhaustion, hunger and demoralization suddenly catching up with them. Caught in a clever double envelopment that has been compared with the Battle of Cannae in ancient times,  many of the British surrendered. The 13-striped, 13-starred American flag, with a single star in the center of a circling constellation, once believed to be flown during the battle, became known as the Cowpens flag. The battle site is preserved at Cowpens National Battlefield. Two ships of the U.S. Navy have been named USS Cowpens in honor of the battle. Three current Army National Guard units (116th Inf,  175th Inf  and 198th Sig Bn ) are derived from American units that participated in the Battle of Cowpens. There are only thirty Army National Guard and active Regular Army units with lineages that go back to the colonial era. ^ Pratt, Fletcher (2007). Eleven generals: studies in American command. Kessinger. p. 12. ISBN 978-1-4325-7926-5. ^ A History of the Campaigns of 1780 and 1781, Banastre Tarleton, Dublin, 1787 (reprint 1781), p 32. ^ a b Babits, 28. ^ Babits, 187, Note 14. ^ Babits, 175, Note 101. ^ Babits, 41–42 and 175, Note 101. ^ Babits, 46, "British Legion Infantry strength at Cowpens was between 200 and 271 enlisted men". However, this statement is referenced to a note on 175–176, which says, "The British Legion infantry at Cowpens is usually considered to have had about 200–250 men, but returns for the 25 December 1780 muster show only 175. Totals obtained by Cornwallis, dated 15 January, show that the whole legion had 451 men, but approximately 250 were dragoons". ^ Bearss, Edwin C., Battle of Cowpens, Originally published by Office of Archeology and Historic Preservation, National Park Service, U.S. Department of the Interior, October 15, 1967, ISBN 1-57072-045-2. Reprinted 1996 by The Overmountain Press. Found at "Archived copy". Archived from the original on August 9, 2007. Retrieved August 13, 2007. CS1 maint: Archived copy as title ( link) . ^ All unit strengths from Babits. ^ "British Plans Tarleton Sent After Morgan". 70th Congress, 1st Session House Document No. 328: Historical Statements Concerning the Battle of King's Mountain and the Battle of the Cowpens. Washington: United States Government Printing Office. 1928. p. 53. ^ a b Babits, 46. ^ Fowler, V.G. (2005). 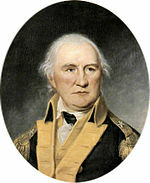 "Brigadier General Daniel Morgan". U.S. Department of the Interior: National Park Service: Cowpens National Battlefield South Carolina. Archived from the original on August 8, 2006. Retrieved December 10, 2007. ^ Brooks, Victor; Robert Hohwald (1999). How America Fought Its Wars: Military Strategy from the American Revolution to the Civil War. Da Capo Press. p. 134. ISBN 1-58097-002-8. ^ Hays, Joel Stanford, "Adam Goudylock (ca. 1726–1796), Planter, of Albemarle County, Virginia, and Union County, South Carolina," The American Genealogist 88, no. 1 & 2 (2016): 49–56, 107–117, at 53–54. ^ Marshall, Volume I, 404. ^ Trevelyan, Volume II, 141. ^ Department of the Army, Lineage and Honors, 116th Infantry. Reproduced in Sawicki 1981, pp. 227–229. ^ Department of the Army, Lineage and Honors, 175th Infantry. Reproduced in Sawicki 1982, pp. 343–345. ^ Department of the Army, Lineage and Honors, 198th Signal Battalion. ^ a b Fischer, David Hackett (July 1, 2000). "Hubris, But No History". The New York Times. ISSN 0362-4331. Retrieved January 14, 2019. Alden, John R. (1989). A History of the American Revolution. Babits, Lawrence E. (1998). A Devil of a Whipping: The Battle of Cowpens. Chapel Hill: University of North Carolina Press. ISBN 0-8078-2434-8. Bearss, Edwin. C. (1996). The Battle of Cowpens: A Documented Narrative and Troop Movement Maps. Johnson City, Tennessee: Overmountain Press. ISBN 1-57072-045-2. Boatner, Mark Mayo (1966). Cassell's Biographical Dictionary of the American War of Independence, 1763–1783. London: Cassell. ISBN 0-304-29296-6. Buchanan, John (1997). The Road to Guilford Courthouse: The American Revolution in the Carolinas. New York: John Wiley and Sons. ISBN 0-471-16402-X. Davis, Burke (2002). The Cowpens-Guilford Courthouse Campaign. Philadelphia: University of Pennsylvania Press. ISBN 0-8122-1832-9. Fleming, Thomas J. (1988). Cowpens: Official National Park Handbook. National Park Service. ISBN 0-912627-33-6. Marshall, John (1832). The Life of George Washington: Commander in Chief of the American Forces, During the War Which Established the Independence of his Country, and First President of the United States. Second Edition, Revised and Corrected by the Author. Philadelphia: James Crissy. Montross, Lynn. "America's Most Imitated Battle." American Heritage, Vol. 7, No. 3 (April 1956), pp. 35–37, 100–101. Reynolds, Jr., William R. (2012). Andrew Pickens: South Carolina Patriot in the Revolutionary War. Jefferson NC: McFarland & Company, Inc. ISBN 978-0-7864-6694-8. Roberts, Kenneth (1958). The Battle of Cowpens: The Great Morale-Builder. Garden City: Doubleday and Company. Swager, Christine R. (2002). Come to the Cow Pens! : The Story of the Battle of Cowpens January 17, 1781. Hub City Writers Project. ISBN 1-891885-31-6. Trevelyan, Sir George Otto (1914). George the Third and Charles Fox: The Concluding Part of The American Revolution. New York and elsewhere: Longmans, Green and Co.
Stevenson, William F. (1928). "The Battle of the Cowpens South Carolina January 27, 1781 – The Battle of the Cowpens Part I". US Army Center of Military History. Archived from the original on June 21, 2013. Retrieved June 7, 2013. Hourihan, William J. (Winter 1998). "Historical Perspective: The Cowpens Staff Ride: A Study in Leadership". The Army Chaplaincy. Archived from the original on June 24, 2007. Retrieved December 10, 2007. Moncure, Lieutenant Colonel John (1996). "The Cowpens Staff Ride and Battlefield Tour". Command and General Staff College: Combined Arms Research Library. Archived from the original on January 1, 2007. Retrieved December 10, 2007. Montross, Lynn (April 1956). "America's Most Imitated Battle." American Heritage, Vol. 7, No. 3 (April 1956), pp. 35–37, 100–101. Parker, John W. "Historical Record of the Seventeenth Regiment of Light Dragoons, Lancers: Containing an Account of the Formation of the Regiment in 1759 and of Its Subsequent Services to 1841". Replications Company. Archived from the original on December 13, 2007. Retrieved December 10, 2007. Withrow, Scott (2005). "The Battle of Cowpens". U.S. Department of the Interior: National Park Service: Cowpens National Battlefield South Carolina. Cagney, James (2010). "Animated History of the Battle of Cowpens". HistoryAnimated.com. Retrieved July 1, 2012.